After giving up an early goal to 4th-ranked Minnesota Duluth, the 2nd-ranked Wisconsin women’s hockey team bounced back, scoring three unanswered goals to take down the Bulldogs, 3-1, on Sunday at LaBahn Arena on Sunday afternoon. Wisconsin swept the two game series. Sophomore Natalie Buchbinder, junior Alexis Mauermann and sophomore Brette Pettet all scored for the Badgers (6-0-0, 2-0-0-0 WCHA) and helped UW head coach Mark Johnson become the all-time winningest coach in NCAA National Collegiate Women’s Ice Hockey history with 465 wins. Johnson passed Mercyhurst head coach Michael Sisti and Harvard head coach Katey Stone for the top spot in NCAA National Collegiate Women’s Ice Hockey history with his 465th career win. Wisconsin’s offense was relentless on UMD goalie Maddie Rooney, outshooting the Bulldogs 11-3 in the second period. Rooney, the 2018 Olympic gold medalist for the U.S., held her own for most of the second until a quick-strike goal off a face-off from junior Alexis Mauermann with 6:04 left in the frame to put UW up 2-1. 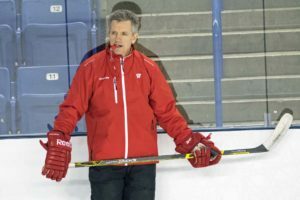 The Badgers also earned their 100th win at LaBahn Arena and the Badgers are now undefeated in their last 33 games on home ice. The Badgers outshot the Bulldogs 43-12 for the game and 87-28 in the series.